We wouldn’t be letting out any new statements if we talk about the wonderful Content Management System/Website Builder/Blogging Platform/ that WordPress has been. Touted to be the most user-friendly and hassle-free CMS, WordPress has really caught a nerve with its users and developers, alike. Being an open-source CMS, people pretty much know a lot about WordPress and its features. However, there is always a hidden element to everything that runs on technology. When we say hidden, we are talking about features that are already there, but people tend to overlook them somehow if they are not detailed up. So, roll your sleeves and let us learn about some obscure WordPress features that you probably don’t know about. There is no denying the fact that too many mouse clicks tend to be irritating and time-consuming at times. Since WordPress is a full-fledged website builder, there is just so much to do with those mouse clicks. So, WordPress offers the feature of keyboard shortcuts which can be accessed in the editor. Editor > Toolbar Toggle > Editor’s Kitchen Sink > Question Mark. Additionally, you can learn about all the Keyboard shortcuts here. This feature appears at the very top when you begin to create a new post or edit one. A lot of people might not know this one, but through this feature of your WordPress editor, you can access a new tray of direct links to several options for editing your post. The ‘Screen Options’ will lead you to some or all of the elements displayed below, depending upon the configuration of your website. A great platform for bloggers of all kind, WordPress was primarily introduced as a writing platform. The Markdown-Style shortcuts enable faster writing where you can use symbols on the keyboard to initiate a new type of text field. E.g. 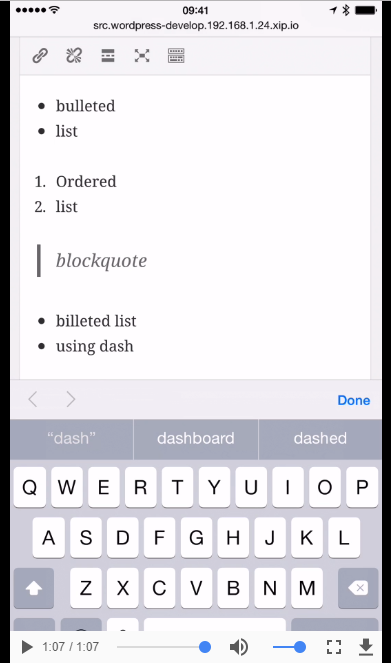 : Hashes (#) will create title text for you and stars (*)will bring up a list mode. Check out the video link below to learn more. Again, WordPress gets as awesome as it could be. The WordPress editor can go into a full-blown Distraction-free mode if you want to stay focused and not get distracted by the many other features present in the editor’s kitchen sink. A lot of times, we need to put up external citings into our WordPress posts for the sake of providing credibility to the subject matter of our posts. These external citings can be a post from Facebook, Twitter, or any other social platform. When providing a plain link isn’t a good option to go with, embedding comes into the picture. For starters, embedding is the integration of the visual elements (images, videos, gifs) and the links of a particular element on the internet which appears as a part of the source post and is capable of driving engagement. 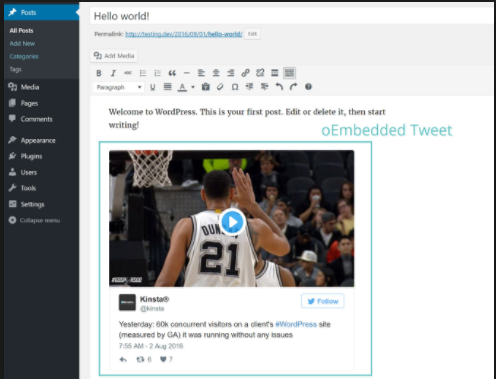 Made available after the WordPress 4.1 update, you can embed content from these sites into your WordPress posts. As we go on creating new posts in the WordPress editor, the old ones get replaced on the homepage – that is a default setup. As and when we are done with creating a new post and the SEO engine kicks in, a lot of time we are forced to update the title of the post due to several reasons. You might be aware of the fact that changing the title of your post will require you to edit the post link as well. If you don’t, the post name will not follow the post title. 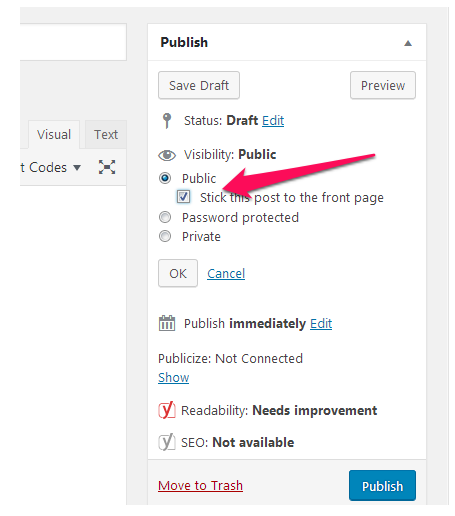 With this particular feature of the WordPress CMS, you can plainly click on the EDIT tab and doing so will delete the existing content. A new post name will be generated on the basis of the updated title. Well, if you are living under a rock, you probably don’t know that you can build a new web and mobile app, a directory-type website, an invoicing system and a lot more. We would like to explore and help you out with these sometime later. So, stay tuned to our platform for information on these. Bonus Features: Here are a few more features offered by WordPress which you might not be aware of. You can change the author name of a post. You can edit images for simple changes such as Crop, Resize, etc; not really advanced ones though. Schedule a post for a future time. WordPress is more than just a website builder. For people who simply adore this platform, the WordPress community always has so much to offer. With every release, new user-requested features are being rolled out so that people can just keep harnessing the amazing prowess of WordPress. If you happen to know any more of these wonderful features which are not quite popular yet, we would love it if you can share them with the peer readers on this platform. So, keep reading, and keep sharing!